If you’re looking for a trusty window cleaning company in Bromley, you’ve come to the right place! We boast experience and expertise, which help us deliver the desired results. The cleaning technicians, we count on, are always equipped with the most advanced window washing technologies, which ensure that your residential or commercial property has immaculately clean windows and improved curb appeal. No more dust and sticky grime on the glass panel when we use our purified water-fed pole window washing system! You’ll get a naturally restored look of your windows without the nuisance wiping and polishing. Book at your convenience any day of the week, including Bank Holiday Mondays! Promotional rates: you can make some savings, when you book more than one service at the same time. We use both a chemical-free and a traditional window cleaning methods, depending on whether the task takes place outside or inside your property. Your interior windows and glass doors will be washed to a perfect finish by using industry-standard cleaning products, a squeegee and a step ladder. When it comes to cleaning your exterior windows, however, we’ve found that the most effective technique is to employ a purified water-fed pole cleaning system. 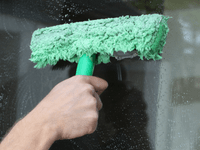 The method removes successfully all impurities, dust and mineral deposits from the glass, window frames and sills, leaving your windows shiny and streak-free. Please, ensure that there are no obstacles present in the immediate area of work so that the specialists can proceed with their job safely. Our company has incorporated a proven recruiting process, which involves thorough background checks and additional training of all window cleaners prior to joining our teams. And the crew in Bromley is no exception. The specialists are qualified and fully insured against damage, so you can count on a professionally executed and at the same-time, a hassle-free service at all times. We also have the practice of monitoring the quality of workmanship at random checks on site to ensure that our service standards are observed and applied by all the technicians. Additionally, we tend to work with persons who have customer-oriented approach, show diligence and attention to detail in their work consistently and to the highest level. Hire a reliable residential window cleaner to take care of the dirt and smear. Remove all the dirt and dust from your commercial property. Clean the glasshouse windows, frames and sills with our company. Call Us or Book Online Your Window Cleaning Service! 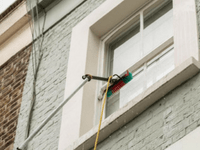 You can call 020 3404 9775 or complete the booking form on this website to make a commercial or residential window cleaning appointment with us that is convenient for you. Alternatively, just click on the live chat button and you’ll connect to a professional advisor from our dedicated customer support team. Our helpful representatives work round the clock to answer your queries, deal with any concerns or reschedule your appointment. So, you can contact them anytime.